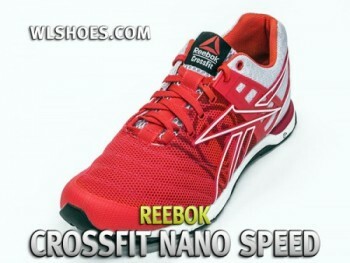 Launching simultaneously with the Nano 3.0, the Reebok CrossFit Nano Speed is a targeted model with a specific purpose – WODs that include running. 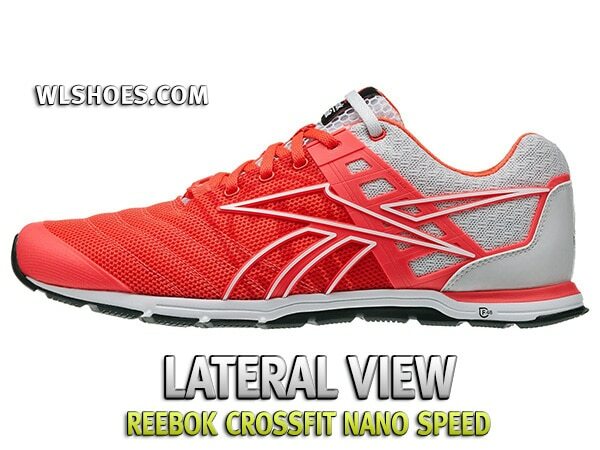 Essentially this shoe takes many of the CrossFit specific design components of the previous Nano models and marries them to a sleek, light-weight runner. This in effect makes the model an opposite of the Nano 3. 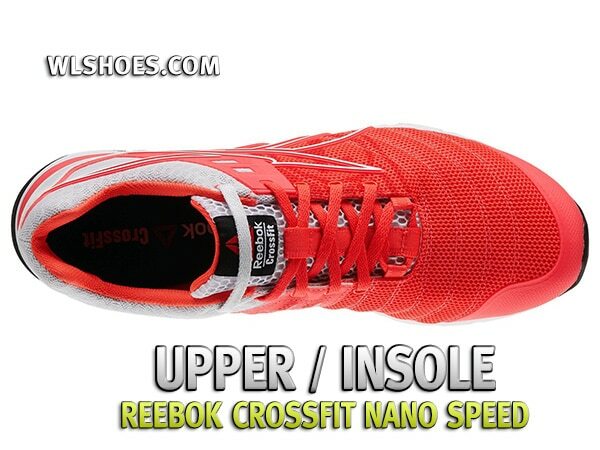 The Nano Speed is a running shoe that can accommodate other CrossFit movements, whereas the Nano 3 is a CrossFit minded design that can get by when taken for a run. Initial impressions … it’s a Nanov8! (a cross between the seminal Inov-8 lines and the Reebok Nano) I’ve worn these in front of several crowds now and the response is almost always the same; “those look like a new Inov8 model in odd colors”. Some say they are a bit 80s retro with their electric blue upper and yellow laces – I guess they do kind of scream throwback. Regardless of your thoughts on the styling, they are not immediately recognizable as a Reebok CrossFit product which may or may not be a good thing. The upper is like a traditional runner, almost to the point of being mundane. There are two different patterns of lightweight mesh which meet around the lacing area where a small section of rubber Dura-Cage webbing aims to provide lateral stability. This is the same technique used on the latest Nano model but in a much more minimal way. There is an obvious effort to reduce materials and save weight on this shoe, and this one weighs in at 252g for a US size 9. It really does present as a simple, almost retro runner. Underneath, things get more interesting. We have a thin but cushioned midsole bonded to a solid rubber outsole. This appears to be the same material as the grippy Nano 3 but with very different construction. There are grooves aimed at providing flexibility, but not to the radical extent of the Nano 3, probably as there is less inherent stiffness to overcome with the slimmer construction. This outsole extends upwards slightly in the middle of the foot to provide a small but deliberate rope-guard area, another hint that these are not your average shoe. The upper design is rounded out with a rubber-reinforced toe-box, albeit a slim one, to provide protection for burpees and other striking movements. So where does this “new-meets-old” approach leave this shoe in the gym? Well for starters, it’ll probably spend a lot of it’s time outside! Compared to previous Reebok CrossFit shoes this one is a natural for pounding the pavement. Not really surprising given its more traditional construction. Out on the road you really appreciate the lighter weight, lower heel, and more tapered feel. These shoes work with you, not against, and don’t feel like they are constantly compensating for their size with fancy design elements. They are simple and this works. They hit a great middle-ground between traditional runners which don’t translate well into the gym, and training shoes which are clunky when the pace picks up. So what about when you get back in the door and hit some lifts? They do pretty well actually. Despite their comfort these are still a low, flat shoe and this always helps. There is enough heel to give a little assist with lifts and plenty of grip. They ultimately don’t feel as planted as the Nano 3 but they are very serviceable and on par with the Inov8 models for lifting. In body-weight or gymnastic movements the shoe performs even better with the lighter weight keeping them nice and agile. Box jumps are great, burpees easy (well, we all know burpees are never really easy!) and they excel at quick changes of direction and movement. All impressions are that this shoe is cushier than an Inov-8. It has a similar 3mm drop to the F-lite 195s, and definitely looks resembles that model more than any other. While the cushion is there, you still have the harder outsole and it is a very different combo to the Inov8 in that regard. The F-lite seemed to move from a running shoe which was more and more tailored for Crossfit, while the Reebok seems to start from a Crossfit base with a definite attempt to become a running shoe. So which works best? Well… both! The Inov-8 is a perennial favorite amongst those Crossfitters who can wear them comfortably; a challenge for those of us with wider feet given their narrower last. But it seems you can find two crowds at almost any Box now – the Inov8 peeps and the Nano peeps. I’ve also noticed it is rare to find someone happily switching between a pair of either. Beyond the issue of fit, the inov8 also has that underground/cult feel of something a little less than mainstream, and some people resonate with that. For those people, I doubt Reebok will be able to successfully tempt them to cross over to the dark side! The surprises continues once you slip your feet in – they don’t fit like a Reebok CrossFit product either. 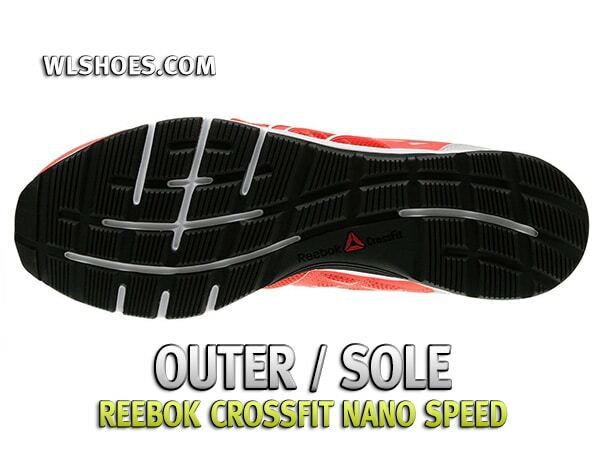 One of the defining characteristics of the first round of Nanos was the wider fit throughout the shoe. My guess is this was a two-pronged strategy: first it was in line with other minimal type shoes which had started to become cult favorites among CrossFit addicts, and secondly because the original Nanos were not running shoes. Well the Nano Speed is exactly that. 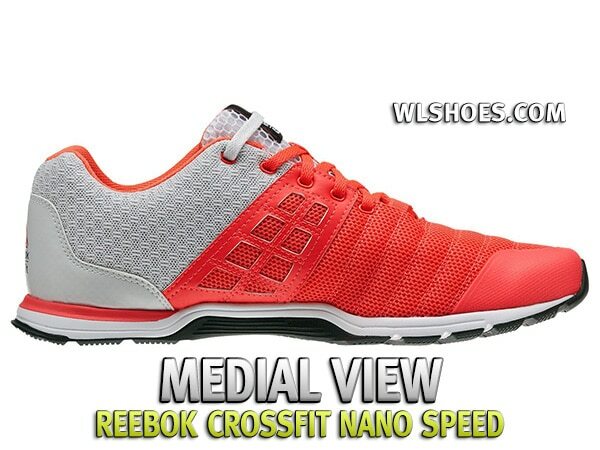 It looks like a remade running shoe with some CrossFit cross-breeding. With the goal of holding up to longer runs, the fit is immediately snugger and prevents the foot from moving excessively within the shoe. In fact it is quite a bit narrower, to the point where these shoes don’t suit my wide foot. The difference is even more pronounced when worn back-to-back with the new Nano 3, which feels wider than the Nano 2. The taper also leaves a bit more wiggle-room at the front than what you will find on the Speed model. Anecdotally, these fit longer but narrower than my Nano 2s, and about the same length as my Nano 3 (but much narrower). They are quite tight across my wide midfoot area. The big plus for these shoes is their low-to-the-ground feel, with a thinner midsole and lower 3mm heel-to-toe drop. Leaving aside their less than perfect fit for me, they are a very comfortable shoe to kick around in with a nice, supple feel. The design of the interior is your pretty standard affair; an abrasion-resistant liner and some fairly plush padding. All things you would expect in a shoe built with running in mind. I think I’m starting to see Reebok’s logic in making this shoe. I expect it will be big amongst the new CrossFit converts – those moving from their old Nike/Asics/Brooks runners into the cult of all things CrossFit. It also provides an option for those people with narrower feet that would have otherwise likely gone with an Inov-8 shoe. 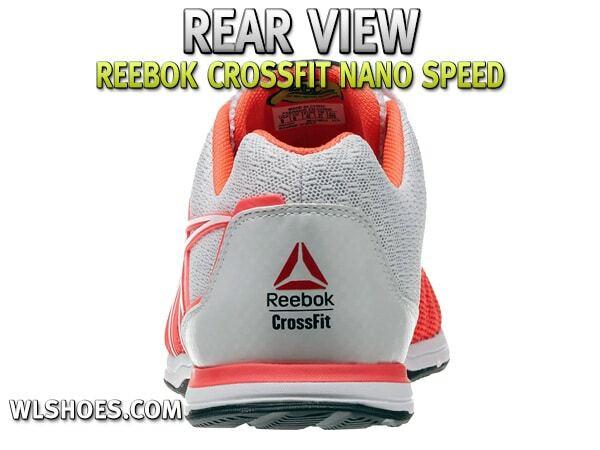 The Nano Speed still appears “mainstream” but it does have the right stuff where it counts. They are much lower to the ground than traditional shoes with less squish, but they are not as big a jump as going to the Inov8s. So I think these will steadily pick up in popularity. They won’t make much of an appearance in my rotation as they are a bit too different to the rest of my shoes, but I can see others getting lots of wear out of them. Most notably people who are new to CrossFit and women who typically have narrower feet in the first place. I’d say for most people, there will be a sweet spot in their collection for two out of the three Reebok styles: Nano 3, Nano Speed and Olys. Just like all the other Reebok CrossFit products, you can buy the Reebok Nano Speed from two locations; Shop.Reebok.com and the CrossFit HQ Store. I’ve had good experiences with ordering (and returning) from Reebok directly so that is the only site I can really speak to. I’m sure both locations follow similar protocols so it really comes down to who has the size and color combination your desire in stock.